AM — MIDCAP Cash Circuit Call - Buy 1 Lack Shares Of SAWACA BUSINESS MACHINE LTD @ Upper Circuit 3.29 Tomorrow tgt 3.80 & next tgt 10.25 in 1 Month. btst Profit = 50000 Rs. AD — MONYMR POSITIONALLY BUY AND HOLD VIJI FINANCE LTD (537820) NSE/BSE ABOVE 11.35 FOR SHORT TERM TGT 18, STOP LOSS 9. Cleaning up the markets of all forms of malfeasance is the market regulator Sebi’s hands-on task, which it has to do 24 x 7, for human ingenuity using the twin prongs of fraud and con is constantly trying to blindside the investor community in order to make a quick buck. After stories on price sensitive information being leaked on WhatsApp did the rounds, the securities market watchdog cracked down on errant players. In this hunt against leak of price sensitive information about listed firms, the Securities and Exchange Board of India (Sebi) conducted searches at premises of more than 30 market analysts and dealers and seized documents, computers, mobiles and laptops around the third week of December last. The searches came on the back of a probe into circulation of unpublished price sensitive information on various listed companies, including some blue-chips, through WhatsApp messages and social media chatrooms. In what was being done brazenly and openly, price sensitive info was being leaked to rig up prices. Sources close to developments stated that Sebi carried out 'search and seizure' operations across major cities. The operations were conducted at the residences and offices of more than 30 market analysts and dealers in the capital market. Registers, documents, computers, mobile phones and laptops, among other things, were seized. The operations involved more than 70 Sebi officials, assisted by the state police departments. This was by far one of the biggest operations since Sebi got their search and seizure powers. 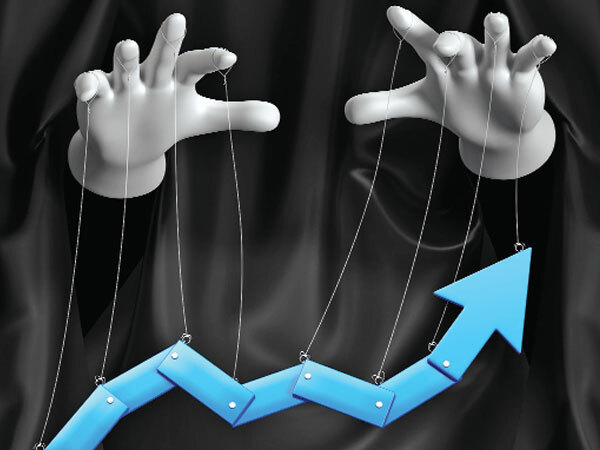 A new tack has been evolved by market manipulators to rig up prices of dubious and shady shares. Day traders and investors are being flooded with SMSes — text messages - on the lines of the three mentioned at the outset. This is a daily phenomenon and while the scrips change, the core messaging remains the same. Vicariously, buy calls are being given right under Sebi's nose daily, cocking a snook at the agencies that monitor the market. So, the script remains the same even as the scrip changes. Moreover, this is being done with impunity. An FC Investigation has revealed that a large clutch of such con tricksters using data obviously compiled from depositories and exchanges are using this subliminal communication system to ramp up shares in clear flagrance of established rules and regulations. The watchdog now needs to use its punitive powers to zero in on these fraudsters who are using communication and technology tools to indulge in speculative activities. FC has provided Monday morning live examples and Sebi and other agencies will all the tools and human resources at their disposal can easily track down the offenders. These messages were received on Airtel numbers and their IDs are given, so Sebi can talk to mobile service operators to get to the bottom of this unsavoury business. It is obvious that somewhere the promoters of these penny stocks or cats and dogs as they are referred to in market lingua franca are also colluding with these operators. Without their sanction, it would not be possible. A rising tide lifts all boats is an old adage. Given the froth and exuberance in the market, with the continuing liquidity gush, markets are only rising in the new year. Do these companies have the commensurate fundamentals to match their share prices and valuations? Take the first one as an example. Ejecta Marketing closed at Rs 63.95 on the BSE on Monday, its 52-week high and low are Rs 52.10 and Rs 372 respectively. Now, comes the killer application - for the quarter ended June 30, 2017, the company posted a total income of Rs 9.58 lakh with a net profit of Rs 1.43 lakh. These financials hardly inspire any confidence. Ditto for other such tips. Ironically on October 7, 2016, Sebi alive to the issue released a consultation paper on amendments and clarifications to the Sebi (Investment Advisers) Regulations, 2013. Though it raised several issues, Sebi's plan to curb the “practice of providing trading tips messages containing buy, sell, hold recommendations on securities“ (i.e. point number 4.5.2) got maximum attention. Had this discussion paper been accepted without any change, no person would have been allowed to provide trading tips and stock-specific recommendations to the public through short message services (SMSs), e-mail, phone etc or through social media like WhatsApp, Twitter, Facebook, etc. unless such persons had obtained prior registration as an investment adviser or are specifically exempted from obtaining registration. It resulted in a huge fracas with Sebi being actively trolled because it was perceived to be an act of controlling social media. Sebi actually backed down faced with the furore and these unsolicited messages kept popping up with gay abandon, the wrath of social media had won the round. Tipsters are using this methodology to front run scrips — first buy a stock and then give buy recommendations on it, which tantamounts to open market manipulation. The regulator had even cautioned investors by saying “it is observed that this activity is carried out mostly by entities based in Madhya Pradesh and Gujarat. Deal with only Sebi-registered intermediaries and check their registration status on the Sebi website www.sebi.gov.in before availing the services; be wary of any misleading advertisements which solicit investments in securities market assuring guaranteed profits. Take informed investment decision without being influenced by trading tips.” But this was a simplistic understanding of the situation and when greed overtakes all other emotions, it is difficult to curb such illegal activities. Also called pump and dump operators (create a volume play, prop up the shares and then dump them at an inflated price), it is very difficult to ascertain whether these numbers are registered under the DND (Do Not Disturb) registry with various telecom operators. Rogue brokers and delinquent tipsters are managing to bypass filters and security protocols. Surprisingly, some of these messages are from fake identities that have similar-sounding names to big-name broking houses such as Kotak Securities, Emkay, Angel Broking, HDFC Securities and Motilal Oswal. The watchdog has made attempts to crack down on entities engaged in unregistered investment advisory and portfolio management activities through short message services (SMSs). In the past, Sebi had noticed that certain entities were offering intraday tips and stock advisory services to investors through SMSes via mobile phones. The regulator, as part of its investigation, obtained details of the call data records of the telephone numbers used for sending such SMSs. Thereafter, Sebi conducted a surprise visit on the premises of one Imtiyaz Hanif Khanda and one Vali Mamad Habib Ghaniwala. It was prima-facie observed that the said persons through their proprietary concerns viz. Right Trade, Sai Traders, Bull Trader and s Laxmi Traders were providing investment advice without being registered with Sebi, it added. Further, Right Trade had solicited business of portfolio ma­n­agement services from the general public without being registered as a portfolio manager with Sebi. The entities had also made misrepresentations by making unrealistic claims, false statements such as having office in various countries, FII-based calls, jackpot calls, etc, and they also made representation in reckless and careless manner in their messages and website suggesting facts which are not true. By their acts and omissions they have prima-facie solicited, enticed and induced investors to deal in securities on the basis of their investment advices, stock trade tips, etc.